• Over 20 years of Taiji Training in Chen-family Taijiquan! Chen Huixian was born in Chenjiagou (Chen Village), Wen County, Henan Province, China – The Original Birthplace of martial art known as Taijiquan (Tai-Chi). Starting at the early age of 6-years-old, she began learning various Chen family Taijiquan routines from her father, Grandmaster Chen Chunlei (who was one of the Chief Instructors at the main Chenjiagou Taijiquan School until he passed away in 1997). Grandmaster Chen Chunlei was a top disciple of 19th-generation Grandmaster Chen Zhaopi. 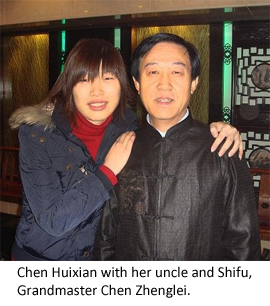 As a youth growing up in Chenjiagou, Chen Huixian attended the Chenjiagou Taijiquan School, training not only under her father but also her uncle, Grandmaster Chen Xiaoxing, (the current Executive Principal of Chenjiagou Taijiquan School and Chairman of the Chenjiagou Chen Style Taijiquan Association). She spent years training alongside other famous 20th-generation Chen family contemporaries, including her cousins Chen Bing, Chen Ziqiang, among others. She also won several Gold Medals for the school in local and national level tournaments and competitions. 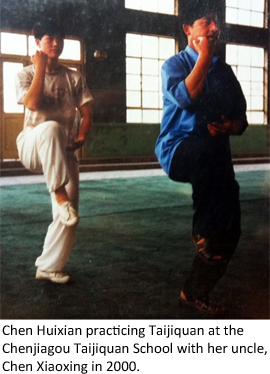 In 1998, she began studying Tai-Chi with her uncle, Grandmaster Chen Zhenglei (one of the famous “Four Buddha Warrior Attendants of Chen Village, and also one of the “Top Ten Martial Arts Masters of Contemporary China”). 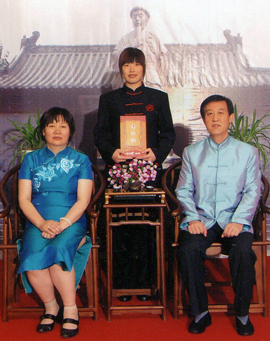 In 2003, after training hard for 5 years under her uncle’s guidance, she became an “In-Door” Disciple of Grandmaster Chen Zhenglei (under Grandmaster Chen Zhenglei, there are three levels of discipleship: "In-Court", "In-Door", and "In-Chamber"). 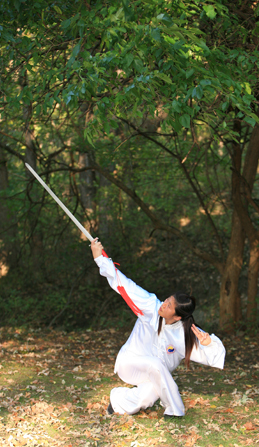 As an "In-Door" Disciple of Chen Zhenglei, Chen Huixian began a deeper study of Taijiquan, including martial art theories and application, combat techniques and gradually formed her own understanding of Tai-Chi development in the world. She began attending numerous competitions throughout China, and has been awarded several medals. She taught Chen Taijiquan full-time at the Chen Zhenglei Taichi Training Center in Tianjin, China while attending Tianjin Normal University, where she graduated with a B.A. in Physical Education. 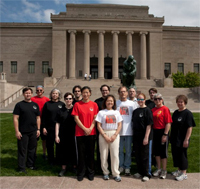 In 2009, Chen Huixian married and an American Chen Taijiquan Instructor, Michael Chritton, and moved from Chen Village to Kansas City to open her own Chen Taijiquan Academy in the U.S. She quickly built a large group of dedicated students and was invited to teach Chen Taijiquan workshops and seminars across the country. She also continued to persevere in her own personal training. 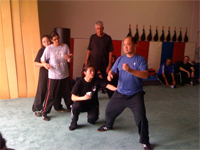 In 2011, after noticing not only her dedication to deeper personal training and her increase in martial Taijiquan skills and ability, but also her success in spreading traditional Chen family Taijiquan in the U.S., Grandmaster Chen Zhenglei raised Chen Huixian to the level of “In-Chamber” disciple (the highest level of discipleship). Chen Huixian is now one of only twenty “In-Chamber” disciples under Grandmaster Chen Zhenglei, and the only “In-Chamber” disciple living and teaching in the U.S.
She is Certified as a Fifth Level (Wu Duan) Wushu, Gongfu, and Taijiquan Coach by the Chinese Wushu Association and the Chinese State Physical Culture and Sports Commission. She is also a Certified Senior Level Coach of the Chen Village Taiji Training Center of China. Master Chen is the President, Founder and Senior Instructor of Chen Huixian Taijiquan, LLC an organization based out of Kansas City for the purpose of spreading the traditional art of Chen Village Taijiquan in the United States. Master Chen travels regularly throughout the U.S. and abroad to teach Chen Taijiquan training seminars to Taiji Enthusiast Worldwide. • Chen Huixian began her professional Coaching Career in 1998, teaching classes in the Chen Village Taiji Training Center located in Zhengzhou City, Henan Province, China. • In 2001 she was appointed the Head Taijiquan Coach for the Yong Tai Temple Monastery Women's Martial Arts School (永泰寺女子武校) in Deng Feng, Henan province, China, the only all-female Shaolin Gongfu school in the country. She taught Taijiquan Gongfu, Push-Hands, Weapons, and competition forms to girls between the ages of 5 and 15. • After a year in Deng Feng, Grandmaster Chen Zhenglei requested Huixian return to Zhengzhou to coach full time at the Chen Village Taiji Training Center. • In August of 2003, she began teaching at the Tianjin Chen Zhenglei Taichi Training Center while she attended Tianjin Normal University. During her 5 years in Tianjin City, she taught hundreds of students, focusing on everything from empty-handed routines and weapons to push-hands and combat techniques. • In December, 2008, she left China and came to the United States to spread Chen-family Taijiquan here in America. • In 2009 Chen Huixian established Chen Huixian Taijiquan, LLC. with the mission of spreading and promoting the traditional art and culture of Chen Taijiquan in America. • In 2011, Grand Master Chen Zhenglei honored Chen Huixian my making her one of his “In-Chamber” Disciples (“In-Chamber” is the highest of the three levels of Discipleship). • March, 1999 - Won the Championships both in push-hands and Tai-Chi traditional boxing at the Fifth Annual Wen County Tournament of Tai-Chi Boxing, Sword and Push-hands. • April, 1999 - First Prize in Spear Routine at Henan Provincial Competition of Tai-Chi Boxing, Sword and Push-hands. • February, 2000 - Won the Championship in Push-hands and the First Prize in Chen-style Traditional Routine at the Sixth Annual Wen County Tournament of Tai-Chi Boxing, Sword and Push-hands. • April, 2000 - Won the Championship in Spear Routine at Henan Provincial Tai-Chi Boxing, Sword and Push-hands Competition. • August, 2000 - First Prize both in Push-hands and Chen-style Tai-Chi boxing at the Jiaozuo City Annual International Tai-Chi Tournament. • September, 2002 - Won the title of "Excellent" at the Jiaozuo City Annual International Tai-Chi Tournament. Michael Chritton began his journey in Martial Arts in 1997 learning Yang Taijiquan and Chinese Boxing from his friend Mr. Craig Terry. Later, Michael began learning Chen style Taijiquan from Mr. Gary Huff at Three Dragons Way School of Chinese Boxing which led to meeting Grandmaster Chen Zhenglei and then his niece, Chen Huixian. 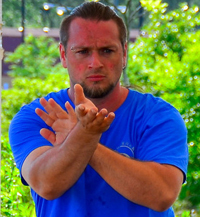 For over 15 years Michael has studied many traditional forms of Chinese Martial Arts including Chen-style Taijiquan, Yang-style Taijiquan, Baguazhang, Chinese Boxing, and Qinna. He has also trained in other arts including Japanese Aikibujutsu and Tantojutsu, Indonesian Pencak Silat, Hungarian Sabre Fencing as well various styles of Knife-Fighting and Knife-Defense. He has studied Chen Taijiquan in Chenjiagou (Chen Village), as well as at the Chen Village Taiji Training Center in Zhengzhou City, Henan, China. Michael has trained under Grand Master Chen Zhenglei and has also studied with many of Grand Master Chen’s family and direct Disciples, including Masters' Chen Bin, Chen Juan, Chen Yuan, Wang Haijun, Zhang Dong Wu, Gao Dong Xiang, Fu Neng Bing, Zheng Ruichen, and Chan Kwok Wah. 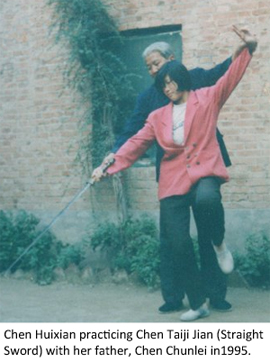 He now trains with his wife, Chen Huixian. Inspired by his brother's martial arts skills, and looking for something beyond his yoga practice, Aaron began learning Wing Chun, Yang-style taijiquan, and a few other Chinese martial styles around 2003. 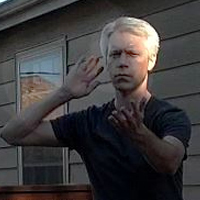 A few years later he saw a Chen taijiquan masters demonstration on an old VHS tape, and was immediately impressed with the beauty of the Chen taiji system. 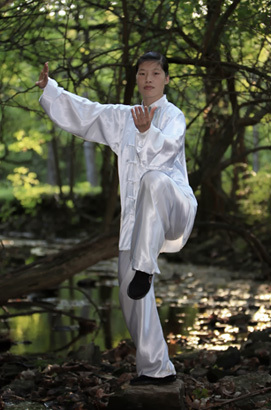 Unable to find a Chen teacher, he continued to study other styles until the summer of 2009, when a friend alerted him to Chen Huixian's Taijiquan Academy. Since 2009 Aaron has proven himself to be a truly dedicated student of Chen-family Taijiquan. Traveling 20 - 30 minutes from Lawrence once or twice a week for over 7 years, Aaron rarely misses a class. In addition to Laojia Yilu and Erlu forms, Aaron has also become an accomplished Chen Taiji Weapons practitioner, learning Taiji Straight Sword, Sabre, Spear, and Guan Dao forms. 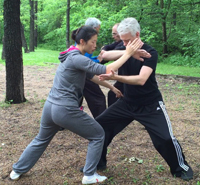 In addition to training and assisting with instruction in Chen Huixian's Taijiquan classes, Aaron Crim also teaches Chen Taijiquan classes in Lawrence, Kansas with the full support of his teacher. 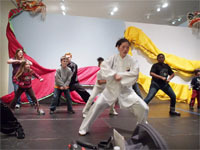 "Mrs. Chen’s performance of Chen style Tai Chi shows excellent techniques. It displays the charisma of a prestigious Master. 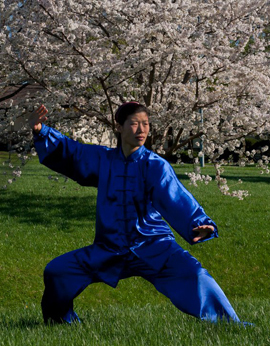 Mrs. Chen demonstrates the combination of strength and softness, and the combination of inner and outer beauty of Chen style Tai Chi to the highest level. It is obvious that she is a descendent of the prestigious Chen Tai Chi family!" "I have never met anyone at her age that can do so well, even in my visits to China. She is to be commended." "Master Chen represents a new generation of Chen Style instructors, who are well trained with the traditional system, understand American culture and speak English." "Master Chen Huixian's teaching and energy is the best that I've experienced so far! She is very free with the details and corrections (if you're brave enough to risk the pain and ask for them!) as she will teach you as much as you are able to absorb. Her knowledge is very in-depth and quite accessible. She gives a very invigorating and refreshing take on the Chen Family Taijiquan teachings!" "It's very gratifying to have one of the original family members here (in Kansas City) because the whole purpose of World Tai Chi Day was to acknowledge this great gift that Chinese culture has given the world in the form of Tai Chi."